Why bother trimming skins when you can get Pomoca-quality Speedskins precut for Dynafit skis? The climbing skins include a patented clamp system designed to work effortlessly on non-race model (i.e. other than Dy.N.A. and PDG) skis. Designed to be ripped off from the tip of the ski, the Speedskins include an easy-to-grab rubber stick that fits perfectly in Dynafit tip notches. 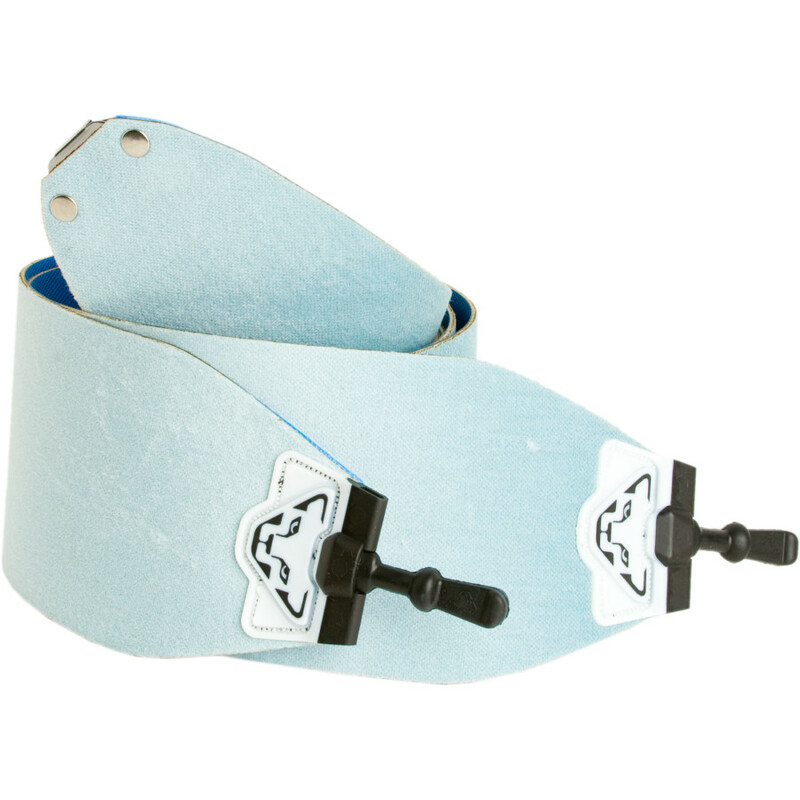 The simple tail clips clasp securely on the flat tail notches found on all Dynafit skis. Waterproof membrane separates the fur from the glue, preventing moisture from compromising the stickiness. Speed Glide finish is applied to the 70% mohair fur to reduce friction and consequently leg burn. 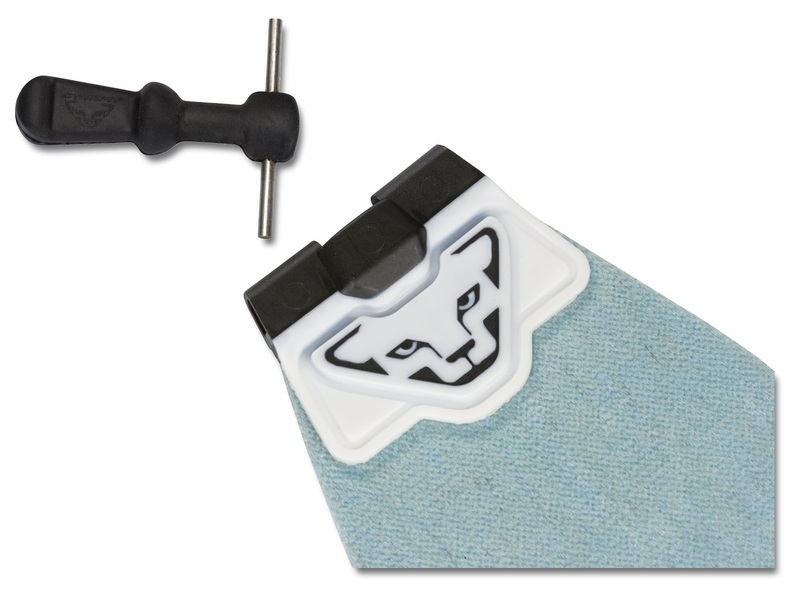 Snow Leopard Grip comes from a combination of special materials that climb well and are abrasion resistant. Anti-stick compound is applied to the bottoms to prevent hateful glomming. Cut to match the Cho Oyu, Carbonio, Speed, Dhaulagiri, Denali, Speedfit, SL 80, etc skis. I have some manaslu 2.0 's in 174 length and 123/90/108 mm side cut. I'm looking at the Carbonio 89 skins as my only closest option. I know they're one or two mm's off, so how exact are they cut? to be right to the edge? Any other options that may be a bit cheaper? I lonly paid 200 usd for the skis so it feels silly to pay the same for the matching skins! Olivia, More important for the precut skins is the length since there is no adjustment. You should be OK there. Skins are cut back 2mm on each side to not cover the edges and you do Not need every mm of base covered. Not sure how the taper on the tip and tail match the Manaslu 2.0, but it looks to be a very good match. Will the SL 80 158 cm skin fit and work with a pair of Speedfit 84 158 cm skis? Hi Tom, yes they will fit and work! Hey, I have Dynafit Cho Oyu skis and I've been wanting to get skins that I can rip from the tip (for weeknight skimo races) and the price of the Huascaran skins is pretty tempting... would buying those skins and trimming and cutting off the tail be a good plan in your opinion? Hi Sam, yes that is always a good option. If you want the tail hook, you need to ensure the skin is long enough and then buy a rivet-on hook. If you don't want a tail hook, just an edge trim is necessary. Hi Jason, lots of options! Fastest for a long race like that would be a race type (Dynafit rubber stick or bungee kit) on some 75mm Trab or 80mm Colltex race material. No tail clip necessary. For full coverage and more general touring use, you could cut down a bigger Dynafit skin and optionally reattach some tail clips. All these parts can be found in our skin parts section. Looking to replace the Dynafit skins for my Manaslu 178 skis. The glue is both too gummy in some places and not sticky enough in other places. These are pretty old. Do you have any stock skins that will fit? How much are custom built dynafit skins? Or should I attempt to repair the glue or do a complete re-glue? (I'd prefer to have a pro do it) Thanks! I would recommend buying the Pomoca Climb Pro S-Glide and cut them to size. The trimming tool is super easy to use, even for a "newbie". We are happy to cut them if you bring the ski in. As far as the skins are concerned, they have the best glide to grip ratio and are a shop favorite. Hope this helps. Hi Pete, if you want to use the Dynafit attachment mechanism, you can always buy a bigger Dynafit skin, cut off the tails, add new tail clips, and then trim the edges. Of course, a full skin build from scratch is always an option, noting it can be tricky to get the tension just right on fixed-length skins. Regina, Sorry, we do not have a precut skin in that model. We can make you a single skin with the same tip and tail attachment, that way you would only have to purchase one skin. Or we can make a complete pair. I have Dynafit PDG Skis and need replacement skins - which product do I purchase? Thanks! Chris. Pretty impressed with the hands on responses and knowledge here. I'm still riding the old Stoke 183s. What's my best bet as the glue is wearing thin? Hey KP3! Thanks for the feedback! Good news: there are a lot of options. If the glue is balling up or getting gross and slimy then your best bet is to strip that layer of glue off and expose a new one. You can do this by taking a sturdy paper grocery bag (not a thin one like a brown paper lunch sack though, those will tear) and ironing it on to the glue until you start to see a bit of moisture seep through. Then just peel it off and it'll "refresh" the glue by exposing a new layer. If the glue is actually coming off or it's getting thin then I'd touch it up in the bald spots with new glue or, depending on how bad it is, just reglue the whole dang thing. The Dynafit skins are made by Pomoca and the Pomoca Skin Glue can be found in here under "Adhesive Tube." You can use a credit card or something similar to evenly apply the layer of glue. I have these for my Manaslus, my wife's Manaslus, and my Cho Oyus. Work great gliding, climbing, traversing; attacment setup is the best around. Glue gets sticky after awhile but they reglue easily. I've renewed the waterproofing with Nikwax and will use BC glop stopper on those days. Even so, I prefer the Pomoca Climb Pro Glide and the S Glides will probably be the next skins I buy--they haven't been quite as ready to glop with snow and seem to climb a little better. I need to replace the skins for my original Dynafit Baltoro woman's ski - length 158cm. Would these dynafit speed skins fit my skis? Hi Barbara, since your Baltoro model has been discontinued there is unfortunately no longer a Speedskin available for it. We do have the necessary parts available as well as a broad variety of material to choose from if you'd like to build your own set. Using them on Carbonio 88s, perfect lightweight high speed skin. Work beautifully if used on the exact ski and length they are cut for, there's close to no adjust-ability so you truly need the exact length and model ski unless you're willing to cut the tail clips off. No buildup of snow under the nose, and no skin failure from the tail, because they have a metal loop acting as the tail clip. Can rip skins from the nose which is always more pleasant than from the tail. I have an older pair seven summits 170cm. What works? Hi Kyle, Dynafit no longer makes a speedskin for that ski. I've checked our inventory and can't find another model that would be compatible. We're happy to build you some skins though! We have the Dynafit tips and a lot of materials to choose from and tail clips. I have Dynafit Hokkaido Ski 176. Which of the Dynafit skins should I use? Unfortunately we don't have any Dynafit skins that would work for that ski. You could consider the Climb Pro S-Glide as an alternative. I'd get the 140mm x 165-180 cm, and then cut them to fit your ski. Looking for dhaulgiri skins for 177cm. Is it true you're out of stock? Hi John, unfortunately those are gone for good. i have a pair of grand teton 191 and 108 under the foot. any one have any ideas on a dynafit speed skin i could make work? Hey Tootall! Thanks for reaching out! Ideally, your best bet would be to get the precut Teton skin, though to my knowledge they haven't been available for a little bit. One option is to get a pre-built skin kit and just not use the tip notch on the Teton. If you can't get away from the tip notch though (I wouldn't blame you if you couldn't I don't think I'll ever be able to) then making a skin is probably your best bet. We will have full stock of material in a few weeks and making a skin for Dynafit skis is actually really simple if you have a hammer and a nail. Send me an email or give us a call if you have any further questions! I have a pair of Dynafit Stoke, which is identical to Grand Teton. I have asked Dynafit and they told me they no longer make skins for Stoke and Grand Teton :(. I LOVE the tip notch. It works so much better than any other attachment mechanism I've seen. How do you attach the tip to another skin? It looks like it's sewn on. Hi Deling, easiest is to cut a hole in the skin, feed the tip through, and fold the skin over the metal bar attached to the rubber tip. Then rivet or possibly sew if that's your bag. Thanks again for you help this past winter with some replacement kit parts. The backcountry Sierra Nevada red fox research was incredible and we got two new fox detections in the park. So...I'm still skiing on my old Dynafit Stokes 167 cms. What are my options for tracking down speed skins? Gotta any laying around? Hey Ryan! Glad we could help the Red Foxes! I don't have any Stoke skins left, and from what I remember the Stoke was only offered in a 164cm, not 167cm, but that may work out in your favor because we ordered a ton of the Huascaran 167 skins for this exact purpose. The Huascaran skin is just a wider and slightly longer version of your Stoke, so you could just cut the Huascaran skin down to the proper length and then trim down the excess width. You were correct on the Stoke size: 164 cm. Whats my best bet for rigging a speed skin for this size? Thank you! Hi Ryan, I'd get that Huascaran167 skin, cut off the tails (optionally adding new hooks), and trim the edges. I have 171 seven summits. I'm assuming these will be a fit for them? thank you! Hi Kathy, we are out of the matching skins for the Seven Summits unfortunately. You could cut down a bigger Dynafit skin and add some tail clips though. huascaran 177? any ideas? TIA. need more words. Hey Bill. We don't have any 177's in stock right now as it's a discontinued ski. However, if you need a new skin we have plenty of other trim-to-fit options that would work with that ski! Send me an email if you have any other questions! Hi! Looking for skins to fit my 164 Dynafit Stoke. Can you help? I'm ready to order!!! Hi Kim, no precuts but you can get a Huascaran skin and move the tails and trim. Any recommendation as to which size to choose to retrofit a 168cm DPS wailer 99 ? Hi Pete, since you're cutting it down, might as well get the Huascaran, it will cover everything!